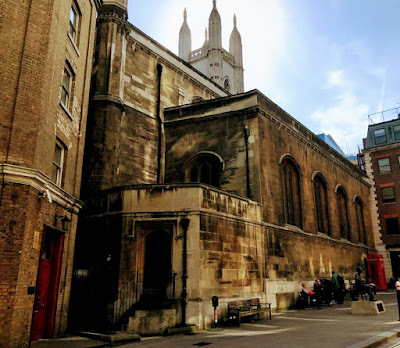 During my strolls through London last week [11 May 2017], between Liverpool Street Station and the USPG offices in Southwark, I visited six Wren churches, and the last church I visited late on Wednesday was the Guild Church of Saint Mary Aldermary on Watling Street and Bow Lane. There has been a church on this site for over 900 years, and it was first mentioned in 1080. The name probably indicates that this is the oldest of the City churches dedicated to the Virgin Mary. Burials in the early church include Richard Chaucer, said to be the father of the poet Geoffrey Chaucer. The patronage of Saint Mary Aldermary belonged to the prior and chapter of Canterbury, but was transferred to the Archbishop of Canterbury in 1400. The mediaeval church was rebuilt from 1510, when Sir Henry Keeble financed the building of a new church. The tower was still unfinished when he died in 1518. Keble was buried in a vault beneath the floor, but his grave did not remain for long. Instead, his vault was used for two former Mayors of London, Sir William Laxton, who died in 1556, and Sir Thomas Lodge, who died in 1583. Keble’s bones were ‘unkindly cast out’ and his monument was pulled down and replaced. In 1629, two legacies enabled the completion of the building, and the work begun 120 years earlier was finished within three years. The poet John Milton married his third wife, Elizabeth Minshull, in the church in 1663. 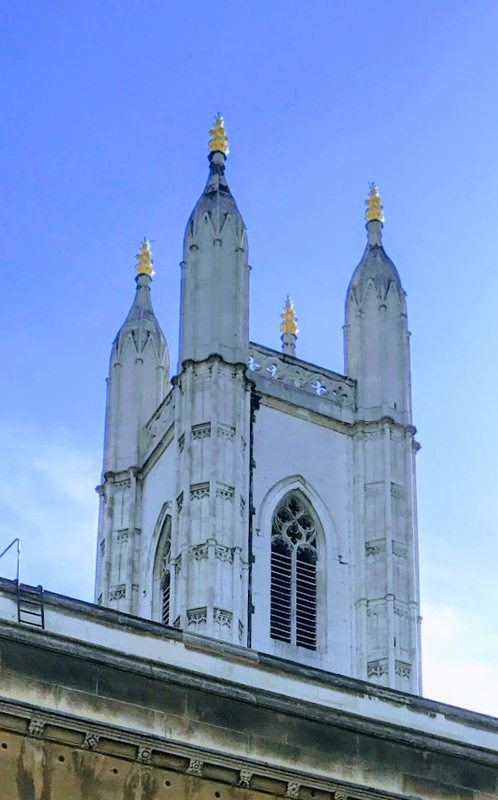 Three years later, Saint Mary Aldermary was badly damaged in the Great Fire of London of 1666, although parts of its walls and tower survived. The church was mostly rebuilt by Sir Christopher Wren in a Gothic style. Henry Rogers left a legacy of £5,000 for rebuilding a church, and his widow agreed to use it to fund the rebuilding of Saint Mary’s. According to some sources, she stipulated that the new church should be an exact imitation of the one largely destroyed. Wren rebuilt the church with an aisled nave, six bays long, with a clerestory and a short chancel. The nave and aisles are separated by arcades of clustered columns, supporting somewhat flattened Gothic arches. The magnificent fan-vaulted plaster ceiling is by Henry Doogood. The east wall of the chancel is set askew in relation to the axis of the church. The slender piers, slightly pointed arches and clerestory are all typic of the Perpendicular style. The Church of Saint Thomas the Apostle, which was destroyed in the Great Fire too, was not rebuilt and the parish was united with Saint Mary’s. A blank monument on the north side of the chancel wall is said to have been placed there by a window who remarried before she had decided on appropriate words to remember her first husband. A new organ was installed, built by George England and Hugh Russell, was installed in 1781. 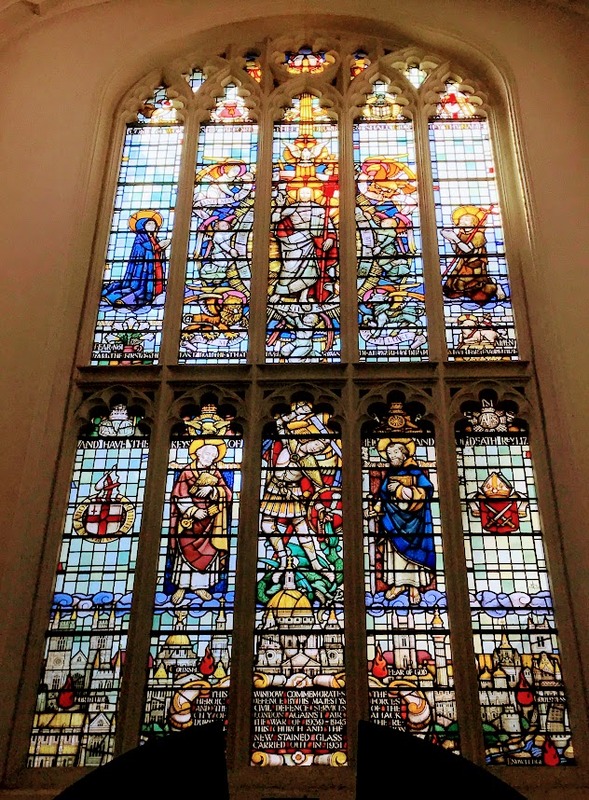 The church has been repaired and restored many times over the years, and major changes were made to the interior in 1876-1877, when most of the Wren-period furnishings were removed. A new oak screen was inserted, dividing the church from the lobby. 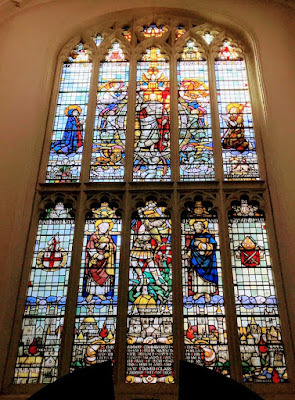 The pews and stalls were replaced, the organ was moved from the western gallery to the chancel, the floor was repaved, new stained glass was put into the windows, and a new reredos was installed. During World War II, Saint Mary Aldermary was damaged by German bombs in the London Blitz. All the windows were shattered and some plaster fell from the vaulting, but the building itself remained intact. The church was designated a Grade I listed building on 4 January 1950. The latest interior restoration was finished in April 2005, when special attention was paid to the plaster ceilings and the memorials on the north wall. Bishop Richard Chartres of London presided at a service on 21 April 2005 celebrating this restoration. Father John Mothersole was the priest-in-charge in 2005-2009, and oversaw further restoration work. He was succeeded in 2010 by the Revd Ian Mobsby, first as curate and then as priest-in-charge. He is closely linked to the Emerging Church and in particular New Monasticism and is an associate missioner of the Fresh Expression Initiative. In 2010, Bishop Chartres and the Archdeacon of London invited the Moot Community to make their home in Saint Mary Aldermary. 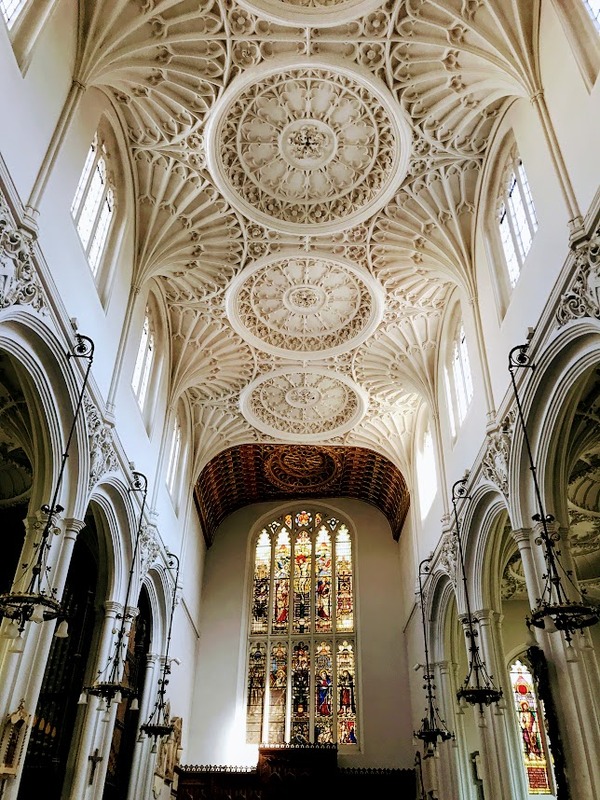 The church hosts daily prayer, regular worship, meditation, discussion groups, conferences and courses on subjects such as justice in economics, conflict resolution and mindfulness. The church also hosts regular art exhibitions and installations, and retreat days. It is home to a café, Host, which sells fair trade coffee and goods, and there is a small market of food stalls outside the church on weekdays.